The programme for ECCMID 2016 has been finalized. Please download a pdf version here or use the online version. 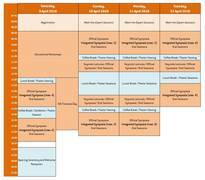 View the programme schedule of the 26th ECCMID by clicking on below picture. ECCMID 2016 will include various different active and interactive session formats such as: Educational Workshops, Scientific Symposia, Meet-the-Expert Sessions, Keynote Lectures and the Trainees Day.